If so many parents trust us with their holidays, it’s because they know their children are going to leave happy and having grown personally. Whether 4 months or 17 years old, we offer activities and facilities adapted to their age, as well as to the season, the environment of each Village, and especially to their personalities. 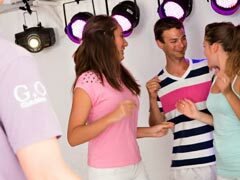 Accompanied by enthusiastic G.Os®, they have fun, marvel, and grow in self-confidence…happy like Kids at Club Med. Travelling with small toddlers is a delightful experience when the family is welcomed in the right conditions. Baby Club Med® features age-appropriate activities, meals especially designed for babies, changing rooms, baby bottles, childcare accessories made available in your room…Check out our baby “friendly services”. During the day, our G.O®s welcome the smallest of guests at “Baby Club Med®”, a space created exclusively for children aged 4 to 23 months of age. Outdoor walks, nursery rhymes, motor skill techniques, music appreciation…The activities are adapted to the age of each child, but also to the seasons and the surroundings of the Village. And when it’s time to eat, your baby can eat with the G.Os® and other Baby Club Med® kids, or share this time with you. The Baby Club Med® service is available at an extra charge to your all-inclusive package in a selection of Villages. Available in Villages featuring a Baby Club Med®, the Baby Welcome® service lets you enjoy both less baggage and peace of mind. Baby beds, a bathtub, bottle warmers, trolleys…All the childcare equipment you need is waiting for you right in your room. Pleasant and modern changing rooms are also available 24 x 7 in the Village communal spaces. The Baby Welcome® is included in your all-inclusive package. To benefit, simply ask for it when making your reservation. - The Baby-Corner: this restaurant area features an assorted buffet and a choice of small savoury and sweet jars with a blender, bottle warmer, and microwave. 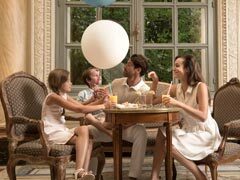 - The Baby Restaurant: a restaurant created just for kids, where the little ones can enjoy delicious and balanced meals prepared for them, with you or as part of Baby Club Med. - The “Biberonneries”: here you’ll find all you need to prepare your baby’s dishes, 24 x 7: a steriliser, bottle warmer, microwave, mineral water, small jars. Starting with Petit Club Med® during the day and ending with the Pyjamas Club® childcare service at night, with a lunch break adapted to their nutritional needs at the Baby Restaurant in between, we do all we can to ensure the little ones enjoy their stay as much as their parents do. This is the perfect time to sit back and relax as you watch your child blossom. For more information on the activities and services (included and at an extra charge) offered by each Village, as well as their availability dates, refer directly to the page of the Village you are interested in. 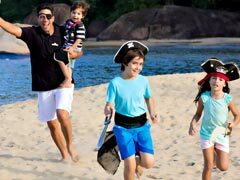 We’ve created a Club Med especially for our smaller guests so they can have just as much fun as their parents! 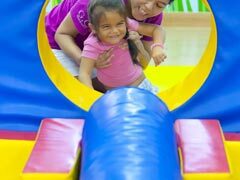 Called “Petit Club Med®”, it offers children aged 2-3 age-appropriate activities featuring sports, crafts, expression, and games. Supervised by our dedicated G.Os®, they’ll have the chance to discover sporting activities, masquerade games, and even take part in a show. Children have fun, learn confidence, and open their minds to others in an environment designed exclusively for them. Petit Club Med® is available for an additional charge to your all-inclusive package in a number of Villages. FAMILIAR WITH THE BABY GYM? Let’s get to it! An escapade around the mini-trampoline, then it’s off to the play mat and its contrasting textures. Nothing beats a fun and colourful motor function technique for learning coordination and balance, finding one’s bearings, understanding how to handle obstacles, and becoming conscious of one’s body. This is the principle behind the Baby Gym, an activity designed especially for toddlers’ developing motor skills. Included in your package, it is also offered as part of the Petit Club Med® activities. - The Baby Restaurant: a location and menu created just for kids. 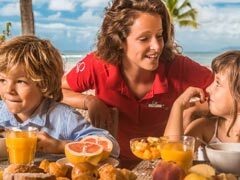 Foodies in the making discover culinary delights with their parents or the Petit Club Med® G.Os®. - The “Biberonneries”: a steriliser, bottle warmer, microwave, mineral water, small jars…Here you’ll find all you need to prepare your baby’s dishes, both day and night. - The “Pyjamas Club®”: collective childcare organised by qualified G.O®s between 7 and 11 p.m. Gentle activities, a peaceful setting: everything is done to help the little ones get ready for a good night’s sleep. Offered in a variety of Villages, the Pyjamas Club® is not included in the all-inclusive package. - Individual babysitting: during the day; or for even more personalised care, you can also reserve our babysitting service à la carte. The Pyjamas Club® and babysitting are not included in the all-inclusive package. We’ve created Mini Club Med® just for 4 to 10 year olds, a kid’s version of Club Med that’s just as amazing as the grown-up one. 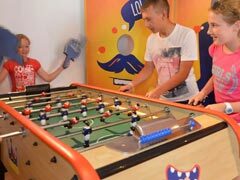 On offer: spaces, meals, and activities designed especially for children of this age, and all supervised by our G.Os®. Your kids are sure to quickly discover new interests in these surroundings, which are ideal for growth. For more information on the activities and services (included at an extra charge) offered by each Village, as well as their availability dates, refer directly to the page of the Village you are interested in. The Mini Club Med® experience adapts both to your childrens' ages and to their continually blossoming personalities. Divided into three age groups (4-5 years, 6-7 years, and 8-10 years), kids will explore activities organised by the G.Os® each day according to a programme featuring four themes: sports, creativity, expression, and games. Flying trapeze, introduction to water skiing, horseback riding, cooking classes, plastic arts, music, dance, games, discovering nature, shows...All of the activities on offer at Mini Club Med® are included in your all-inclusive package. At Mini Club Med®, everything is arranged so that guests take their meals and snacks in the company of G.Os® at the Baby Restaurant. But you’re also free to spend this time with your child: nothing is mandatory. Our Chefs take extra care to develop dishes that cater to the needs of each age group, and above all that are mouth-wateringly delicious. Even the fussiest little gourmets will have no trouble finishing their plates. Nothing mandatory, a massive amount on offer: this is our special approach for 11 to 17 year-olds. Passworld® spaces, Junior Club Med, personalised lessons…The sites and activities planned for them respect their individuality, pace, and likings to provide them with holidays adapted to their age. When you’re a teenager, you want your own space, away from the adults…and kids. At home, it’s their room; at Club Med, it’s the Passworld®. A cool and modern space custom-made for 11 to 17 year-olds by famous designers. Open during the day during school holidays, the Passworld® features specific sporting and artistic activities in which your children can choose to participate or not, with other youth their own age and supervised by qualified G.Os®: film design, mixing, a DJ booth, dance floor, video games. Depending on the destination: wakeboarding, flying trapeze, beach parties, evenings at the cinema…every day, Junior Club Med’s dedicated G.O®s offer 11 to 17 year-olds a variety of creative and sporting activities, and there’s never any obligation to participate (after all, a poolside nap is quite nice too). A great Club Med classic, Junior Club Med features an intelligent mix of socialisation, discovery, and autonomy…always enlivened by the G.O®s' positive vibes. Teenagers have access to all the same à la carte sporting lessons offered to adults. Golf, tennis, horseback riding, kite surfing, fitness, sailing, diving, scuba…Everything one needs to get their feet wet or polish up their skills, in small groups and with a vast range of sporting activities depending on the Village and season. * The teenager Spa: In Villages with a Spa, 11 to 17 year-olds can reserve treatments designed exclusively for them. Not included in your package, these moments of well-being may only be reserved on site. * The Multi-Ski Menu: Included in your all-inclusive package, it offers snow-loving teenagers a mix of activities that are "mountain" all the way: freestyle skiing, snow park, off-piste skiing, forest skiing, slalom, introduction to ski cross, and mountain security rule awareness. The Multi-Ski Menu is only offered in certain Villages during school holidays.